I always enjoy reviewing mechanical keyboards, and I was extremely happy when Cooler Master sent me the Quickfire XT to review as I am in the process of currently changing work keyboards and am a bit undecided on what to purchase as a replacement. The Quickfire XT is the full size brother to the Quickfire Rapid, and echoes many of the same styling choices. The CM Storm Quickfire XT is provided in a fairly standard looking CM Storm box, the front features a full size image of the keyboard as well as a proud proclamation that the keyboard is made in Taiwan the switch type in the keyboard is also shown; the one we are reviewing is a Cherry MX Blue keyboard, which means that the keys have a very nice reassuring click to them. Opening up the box shows the keyboard itself, or would if the keyboard wasn’t concealed in foam bag to help prevent the rubberised texture from scratching in the box. 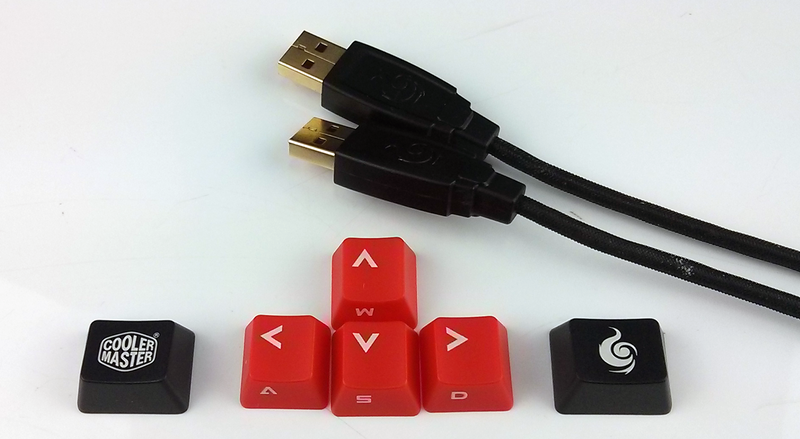 Provided with the keyboard is a plastic key cap puller and some additional keycaps, one set which can be used to replace the WASD keycap area and one set that can replace the Windows key caps this second set feature the Cooler Master and CM Storm Logo. 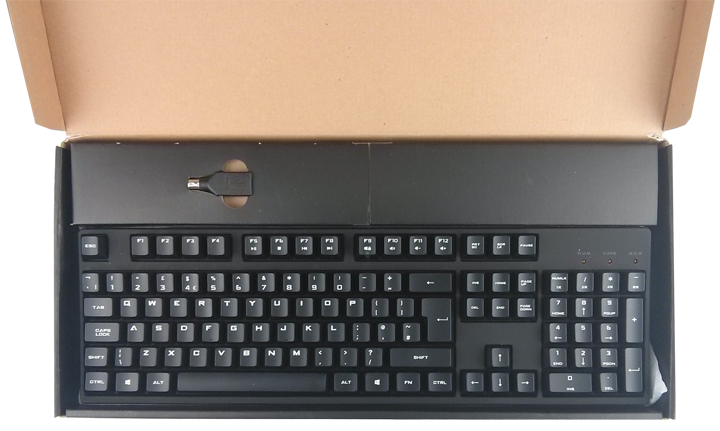 Unlike previous CM Storm keyboards the Quickfire XT has quite a subdued look, and features less branding, apart from the included replacement keys the XT has the CM Storm Logo on the back edge; this was one of the main complaints in previous models as it often detracted from the look of the keyboard. Blues are a very nice switch to use, and the pronounced click that they have is very satisfying when typing – my typing experience was short lived however because of an unofficial ban on Cherry MX blue keyboards in the CCL office meant that I couldn’t use it as much or as long as I had wanted to. Having used the Quickfire TK for a while, I have to say I enjoyed it, the build of the keyboard is extremely nice and the keyboard is extremely sturdy and while the rubberised texture may not be to everyone’s tastes, it fits the subdued style very nicely. One slight issue concerns the price of the Quick Fire XT which makes it a bit of an oddity in the Quick Fire range, its price currently sits at around £78, and in the range currently the Quick Fire Ultimate with Cherry MX Browns is available for just a few pounds more at £81 which has better features including a full LED backlight, and N-Key Rollover via USB, because of this close competition with itself it makes it a difficult sell. All in all the Quickfire XT is a very solid mechanical gaming keyboard, but one that is unfortunately overshadowed by others from the same manufacturer.